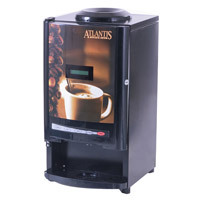 The Atlantis Micro - the first indigenous two lane coffee Atlantis Micro Vending Machine to be introduced at a channel partner price of Rs.9,900. With the addition of the Atlantis Café Plus three and four lane machines to the fold, these three models have held strong in both the domestic and international market for the last six years. Compact machine ideal for small shops and offices. Token machines available in 2 Lane & 3 Lane. Ideal for small of Office/shops and cafeterias. Attractive compact design making the machine easily portable. 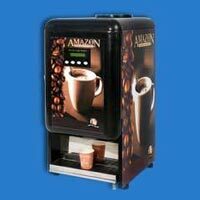 Different from regular hot beverage vending machines. Light weight - Machine weighs only 5.5 kg. Low power consumption of 500 watts only. No water jar or pump required. The machine has an inbuilt water reservoir of 5 ltrs of usable water, which can be manually poured into the machine. Easy to adjust powder and water quantities. The machine comes with preset powder and water, but the same can easily be increased / decreased by using the buttons on the front panel, even for individual cups. The Atlantis Micro is path breaking in pricing, size, ease of transportation and ease of operation. Keeping these in mind, we expect it to drastically increase the width of the market for vending machine by providing accessibility to hot tea and coffee for even the smallest office, institution or outlet where only a few cups are required.